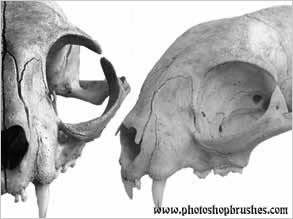 This Cats Skull Photoshop brush set is based on hi res photos of one of our cat's skull was recently dug up by Rabbits, Peter is as most deceased pets is buried on my Mums farm in a special area now heavily invaded by rabbits. The Adobe photoshop brush set features 2 brushes, front view and side view. I have also a selection of other Animal Skulls Brushes which I have found round the farm which will be featured soon on the site, just need to work on them in photoshop and remove the backgrounds. I took several shots before we buried it again, if these become popular I will add some more.